Of all the systems that come together to make your home function properly, none are more essential than your drains and sewer line. Larry & Sons recognizes the importance of having a functioning system to remove the large volumes of waste and water from your property every day. We provide the quality services you need to help keep your drains and sewer system running properly, and avoid a disaster from happening. With nearly 50 years of experience, Larry & Sons has what it takes to install, repair, and maintain your drains and sewer lines. A functioning drainage and sewer system requires the proper installation of an experienced professional. 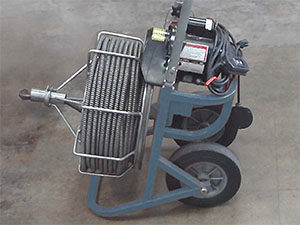 Larry & Sons offers comprehensive sewer line and drain installation for standard drainage in municipal water supplies, septic systems for those not connected to a city sewer system, and drain tile systems for basement water removal. Our expert technicians carefully install new drainage pipes and systems, and hand select components that match your system’s specific needs. Larry & Sons provides high end drainage and sewer system repair and maintenance services. Whether you have a current clog that needs fixing, or are looking to prevent future clogs are skilled technicians will be there for you. We only use the newest technology in the industry to repair your plumbing system’s problems the right way. For preventive maintenance, Larry & Son’s offers annual checkups on your sewer and septic systems. Our technicians carefully inspect your entire drainage system with video camera pipe inspection to prevent future problems before they happen. Our annual maintenance services also include comprehensive drain cleaning to keep your pipes clear. A broken pipe or sewer line can be detrimental to a home. That’s why Larry & Sons is there for you 24/7 for all your drain and sewer needs. With our trenchless and no-dig technology, we’re able to repair your problems without disrupting your property more than necessary. If you’re having drain or sewer issues, give Larry & Sons a call and we’ll be there to diagnose and repair your problems fast. Any place where water is contained is susceptible to clogged drains. Your drainpipes are particularly susceptible to clogs and other blockages because of the amount of use they get and all the various things that we put down them. No matter what’s blocking your drain, the expert plumbers at Larry & Sons can clear it with ease. To prevent these things from blocking your drains and causing damage, Larry & Sons recommends that you use hair and food stoppers throughout your home. These nifty additions to your sinks and tubs can reduce the amount of hair and food scraps that end up in your drainpipes. While stoppers can help, sometimes clogged drains are inevitable. When this happens, don’t hesitate to call Larry & Sons. Our team of plumbers respond to service calls quickly, and use the latest technology to target problematic areas so you can get back to the comfort of your home.